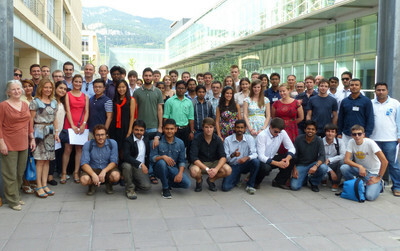 Today I came back from an amazing two week summer school that was offered by EIT ICT Labs at the University of Trento. Topic was Privacy, Security & Trust. EIT ICT Labs is a EU-funded organization that aims to bring leading research into practice. In my opinion this is especially important in cryptography. There were so many great achievements in crypto in the last two decades, but we just can not see real products which use these, and so their value for society is still limited. One speaker at the summer school has put it this way: Traditionally, the EU has funded research, then companies used the discoveries, increased sales, and payed taxes from the money they earned. But the gap between academia and industry is too large. Thus the EU wants to bridge it. Therefore the summer school consisted of two parts. In the first week prominent speakers held lectures on modern cryptography. There were Jan Camenisch (IBM Research, ERC Fellow), Yvo Desmedt (University of Texas at Dallas), Yehuda Lindell (Bar Ilan University, ERC Fellow), Anna Lysyanskaya (Brown University), David Naccache (Panthéon-Assas University, École Normal Supérieure), Moti Yung (Google, Columbia University), and Timothy Edgar (Brown University). In the second week we then took those concepts and designed products in small teams. At the end, we pitched our ideas to real investors, who rated them in terms of technical and economic feasibility. My team and I won 2nd place :). This entry was posted in Uncategorized on August 9, 2014 by Tobias Boelter.